Advanced air defense system will be able to shoot down targets in Israel, too. The Russian Air Force base in Latakia will be reinforced with S-400 SAM system, which will soon be deployed there, Russia's Defense Minister Sergey Shoigu said on Wednesday. News site RT reported that Shoigu said at a Defense Ministry meeting, that the S-400 "will be deployed on Khmeimim airbase in Syria." The S-400, Russia's most advanced anti-aircraft defense system, is as an upgrade of the S-300 Growler family, designed and developed by Almaz Antei. 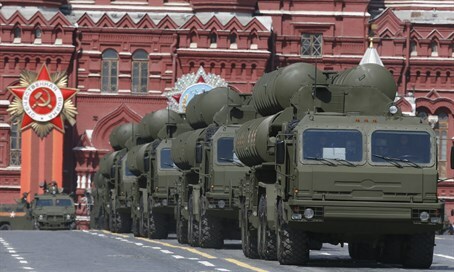 The S-400 uses long- and medium-range missiles that can hit aerial targets at ranges up to 400 kilometers, making it capable of striking targets in Israel as well. It can hit tactical and strategic aircraft as well as ballistic and cruise missiles. The S-400 can bring down airplanes at up to 90,000 feet - more than double the height of a cruising commercial airliner. No less than 300 targets can be tracked simultaneously by the radar complex of the S-400, which sports six anti-aircraft missile launchers. Khmeimim airbase in Latakia, Syria, accommodates Russian Air Force squadrons of Su-27SM and Su-30 fighter jets, Su-34 and Su-24 tactical bombers, all of which taking part in airstrikes on Islamic State positions. The airbase is protected by state-of-the-art air defense systems and radars. Khmeimim also has a fully operational unit for maintaining fixed- and rotor-wing aircraft and providing logistical assistance to pilots. On Tuesday, a Russian Su-24 jet was shot down by a Turkish F-16 fighter jet near the Turkish-Syrian border. One pilot died in the incident, and the second one was rescued and brought to the Latakia airbase. According to RT, Moscow insists the jet did not violate Turkey's airspace. The pilots ejected from the jet above Syria's territory, four kilometers from the border. Shortly afterwards, the Russian Ministry of Defense said it would be providing cover by fighter jets for every airstrike, boosting air defense by deploying guided missile cruisers off the Latakia coast, and suspending all military-to-military contacts with Turkey. In the past there have been Arab media reports of Israeli airstrikes in Latakia against advanced weapons shipments headed for the Iranian terror proxy Hezbollah in Lebanon. Those operations would now be greatly threatened by the Russian deployment. A Russian official recently said Moscow signed a deal with Iran to ship the S-300 anti-missile system to Tehran. The controversial transfer will take place by year's end according to Iran, which could feasibly use the system to thwart strikes on its nuclear program.